It’s been a great couple days so far here at the World Stem Cell Summit in Atlanta. 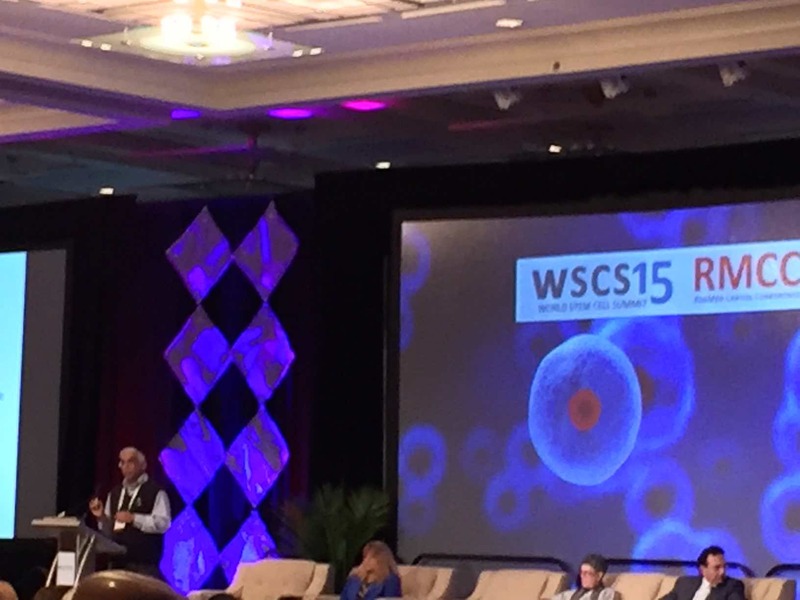 You can follow it on Twitter using the #WSCS15 hash tag. S.
I first attended it 5 years ago in Pasadena. One of the special aspects of WSCS is it brings together diverse stakeholders in a way that just doesn’t happen elsewhere. For instance, you can have the FDA, patients, physicians, scientists, and funding agency people all in one room together. Some strong impressions so far include the following. IPS cells. There is a great deal of excitement here about IPS cells of course, but Mahendra Rao providing a more sobering perspective. I’m more optimistic than he is. Here are his six “realities” of IPS cells, which I interpreted as his view of the top challenges. Allogeneic therapy is not going to work unless HLA matched. HLA matching requires a larger number of patients. There is not enough cGMP capacity to make all the lines required. The cost of making a line and the time required to make one make this an expensive therapy and probably not useful for a large number of diseases. Cells may not be mature enough for use even if one could solve all of the above problems. No real model for true autologous therapy where manufacturing is involved (no amortization and no comparability). CRISPR and human germline modification. I was on a panel yesterday on human germline modification that I enjoyed a great deal. I was on the panel with Aubrey de Grey and Aaron Levine, who both gave fantastic talks. The audience asked spot on probing questions as well. There was some disagreement regarding the appropriate level of urgency for developing policies and/or regulations on human germline modification, but overall my sense was that us three panelists perceive that attempts at CRISPR-based human heritable modification are almost certain to occur in the near future. There’s real promise for CRISPR-based therapies in the future for rare genetic diseases (not to mention all the great in vitro CRISPR research on humans cells in the lab that should continue), but to get from point A where we are now to point B where we might as a field hypothetically be ready to responsibly use CRISPR in the germline for humans is a long road. Thus, irresponsible clinical attempts in the next few years would be very dangerous and could be harmful to the field and society. Still, patients in the audience passionately pointed out that in many cases there is a profound need for helpful therapies now and in the immediate future. That “patient drive” as it was termed at the Washington DC meeting last week on human germline modification is powerful and must be part of the discussion. Innovation in brain cancer treatment including CAR-T. We also heard earlier about transformative approaching such as stem cells loaded with toxins and CAR-T therapies for cancer. Very exciting stuff! Patients and stem cell clinics. In a session today that I chaired, we heard much more from patients. They articulated better than anyone else could about how difficult it is to get reliable information. How does one know if a certain therapy is legit, safe, and worth getting? Where are sources of information? I’d recommend some of the websites list in the link section of this blog (scroll down the right side of the page). Dr. Steven A. Davis, co-founder of SymBioSys, Inc. gave a great talk using the example of the Texas stem cell clinic CellTex, now operating in Mexico, as a test case and as a way to introduce the key issues that need discussion more broadly. We then spent a good 45 minutes have questions and discussions. It’s clear that there are many gray areas and difficulties in this arena. The leader of the Mexican Stem Cell Foundation (unfortunately I didn’t catch his name, but if I find it I will add it in here later) gave some helpful context for understanding where things stand in Mexico. His sense was that the Mexican equivalent of the FDA (COFEPRIS) is not currently equipped to carefully evaluate all the stem cell clinics there (often clustered on the border and catering mainly to American patients). However, he did indicate that his perception was that things are improving. Overall. I have to thank Bernie Siegel, who is the organizer of this amazing meeting, and his team at the Genetics Policy Institute (GPI). They do a phenomenal job every year on the WSCS. More talks are ongoing right now including a fascinating one on cord blood and its potential use for neurological disorders….stay tuned. Certainly this is still the big problem for patients as we discussed here for several times already. Now, you are on a conference, This conference with many experts may has the power to change something and may improve the situation. In my opinion the conference should demand that every clinic and every physician should be legally obligated to publish their data about used new stem cell therapy. This would help all, the patients and the scientist. I think only such a law could help here. It seems to me that there are some or maybe a lot of stem cell clinics, who are even not interested in the outcome of their own therapies. This must be changed. From my point of view it is impractical that there are therapies, which were used thousand times, but nobody could seriously say, if these therapies will work, because the outcome is not checked. Just remember our discussion about PRP to treat avascular necrosis under another topic (“Patients guide to treatment). There are several physicians who offer this treatment and there are reliable case reports (one successful case I have seen myself). But nobody could say, how often this therapy works, Are the healed patients just the lucky ones? and the therapy works in maybe just 1 percent of the patients? Or has PRP the power to heal maybe 50 percent??? Nobody knows, but nevertheless PRP is used and gives hope to many patients. Just summarized in one sentence: We all need reliable data!!! I think only a law could bring us these data. This is maybe a bit off topic, so feel free to ignore, but where do you stand on the use of CRISPR for in vivo somatic gene therapy? Advocates like George Church seem to be very gung ho about it being able to be used safely throughout the human body. This would be a revolutionary technology, but I am a layman and am not sure if Church and colleagues are engaging in wishful thinking? Also do you think in vivo somatic gene therapy using CRISPR will reach the clinic before germ line therapy (of course ex-vivo CRISPR gene therapy is soon to be used in CAR T Cells and other ex vivo genetic cell therapies).